This week my cold seems to have subsided, and I felt well enough to go back to work in my part time job, and all along I've been teaching my classes. And I've been trying to get some rest when I can. The result is that I haven't been in the Studio for over a week. But I figure my rubbing style proofs must be dry by now, so I'd spend part of my Saturday doing some artwork. Got to the building around 2:30 pm and went inside, only to find one little problem. The door to the stairway that leads down to the basement had a new doorknob with a lock in it, one that would require a key. 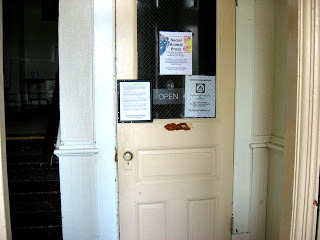 In the decade or so that I've had a space in this building there has never been a lock on this door. And it was locked. And I did not have the key. Luckily I know the building quite well and know other ways to get to the basement. Chose the elevator, got to my space, tossed my backpack onto my table. My mission today was to finish the prints from the mermaid block. As I expected, the ink was dry on the proofs so it was safe to proceed. Had to take the roundabout route back to my car and got my bag of supplies related to this piece, and then my long path back to the basement. 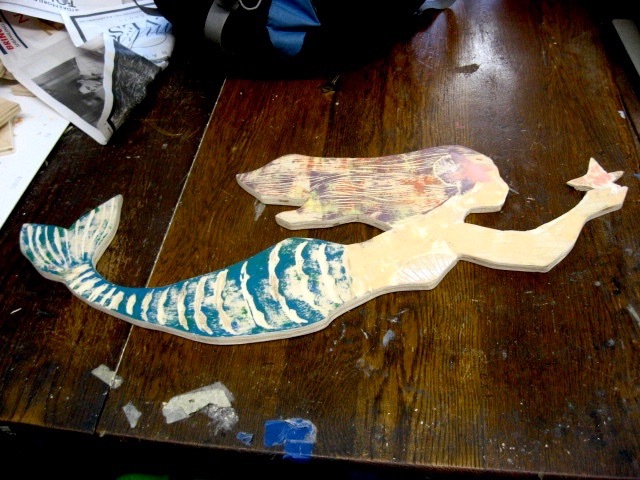 Wanted to work on two pieces of the mermaid today- the final layer of her hair, and another layer on her tail. 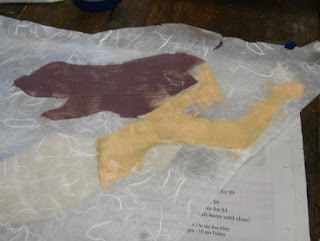 For the hair I mixed yellow and white, spread it thin, used a hard brayer, and rolled it out. Over the layers of darker ink from previous sessions, textures were produced. 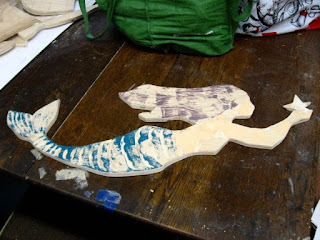 The remaining lemon yellow ink was incorporated into a new blue ink (with a squeeze of pthalo blue) to make a new layer for the tail, and that was rolled on. Did this with both proofs that I had. Results can be seen above and below. And I think that's all the ink I will be putting on these rubbing proofs. Still don't have a plan for these things yet, but I got them. Left them in the Studio to dry. The process has left some color on the block itself, ink that worked through the thin paper. No problem, as I will be coloring the block eventually. The block in its current state can be seen below. I washed the tools and palette and gathered my stuff. I picked up my backpack and there on the table was a shiny new key. Guessed it had been left for me for the new lock. Once again took my circuitous route to my car to drop off my stuff, then back inside to try the new key. And it was indeed the key to this new lock. Put it on my ring. I don't know if they plan to have this door be locked at all times and there was no one around today to ask. The current state seems to be a fire code violation. But I was able to leave the basement, so I'll leave the art to dry for a while, and start thinking about what my next project will be. Still suffering the effects of a long cold that has been hanging around for weeks, but Tuesdays are often Studio days for me anyway, so I took a moment to go in and advance my mermaid project by a little bit. Actually I had stopped by yesterday to check the progress of ink drying on my proofs, and found some sections fairly dry, others still thick with wet ink. That thick ink could take a long time to dry, and not wanting to wait forever to finish this thing, I gave some thought to how I could work around the problem. As a professor one of my main jobs is helping students to figure out how to solve art related problems, and having taught 2D, 3D, drawing, printmaking, and some general classes, there are few art related problems I haven't dealt with. When I checked out the proofs yesterday, I found the green ink on the tail was still wet, so I put that off for another day. The dark mass of her hair was fairly dry, but not the starfish or the sand dollar on the side of her head. So that was the place to work on today. I figured out something. My plan for the hair was always to go over the dark part with light highlights, a common approach artists use to show depth in hair, leaves of a tree, etc. 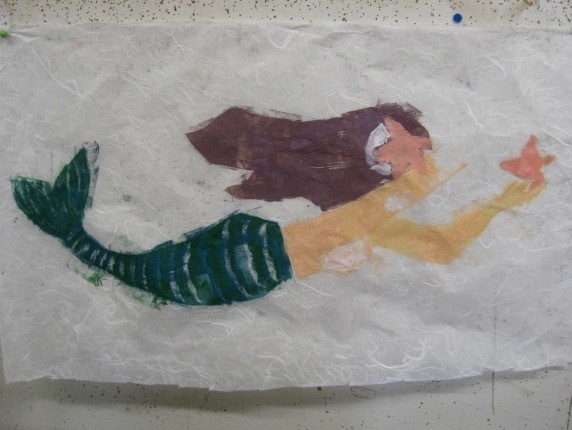 Rolling my brayer over the sand dollar and star fish would have probably spread those inks into her hair, not a desirable thing. So I took some scrap drawing paper, took an offset print off those parts, cut out that dual shape, and placed it on top of the print, exactly over the place it came from. Using the cut piece as a masking stencil, I could safely roll a hard brayer over all the hair, applying a textured layer of a medium value orange over the dark mass without contaminating anything else. It all took less than an hour, including clean up, to do both proofs. Results can be seen above. Not quite done with the hair yet, but this is an improvement, and eventually a layer of blonde hair will go over what's here, adding further depth. I'll deal with the tail another time. 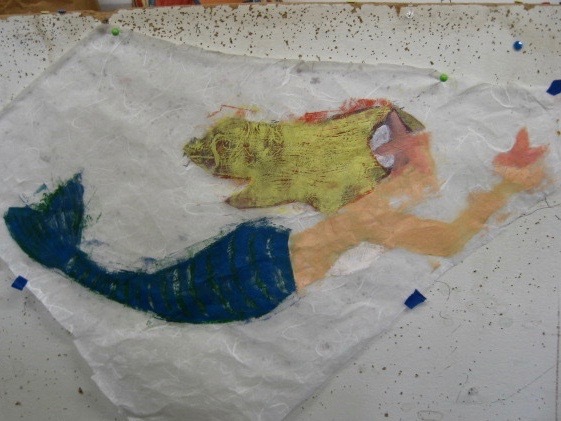 I had business in Ocean Township today, and decided to divert to the Studio to continue work on the Mermaid print. The block and tools were already in my car, the inks and more tools and the early stage prints already in the Studio, and I had maybe an hour to spare. Time to get a little more done. I had left the two prints in progress in the Studio, and found them to still be little bit wet. When water based ink is printed it tends to dry pretty quickly, but the process of printing results in a very thin layer of ink, while this rolling system I was using leaves thick layers sometimes. 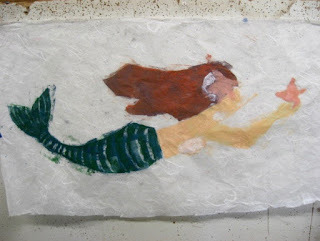 Mixed yellow, red, and white to make a pale orangish color and used that to do the starfish, and straight white for the sand dollar and scallop shell bikini, most of which was applied with a brush, due to the small size of the items. Still using the block underneath to make the shapes. Added a layer of green (with some yellow and white) on top of the tail, this time with a hard brayer to accentuate the carved shapes. The next step will be to put the light layer of hair on top, but there's too much wet ink up there to do that today. 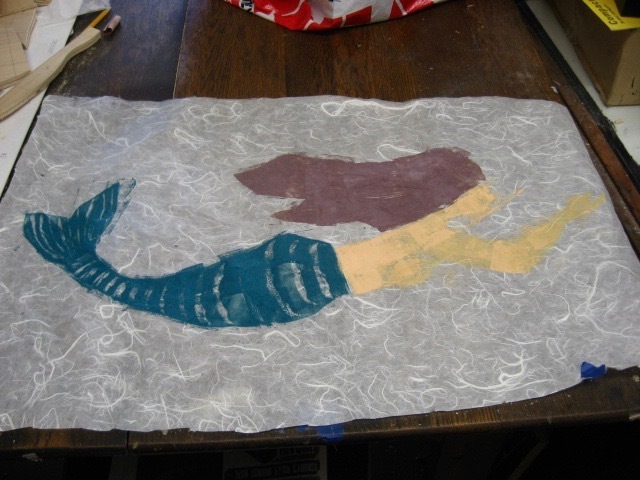 A little more color has found it's way through the paper and onto the block, but the block will be colored eventually with the same colors, so this isn't a problem. I'll leave all the prints in the Studio to dry and maybe see if they are ready to be continued next week. Feeling a bit worn out from a lingering cold plus working many days each week, but I don't like to waste a good Studio day. Arranged a doctor appointment late in the day, and had nothing else going on, so I went and did some more mermaid work. Like I said last time, my plan was to take some prints before I finish and turn over the sculpture to the person who requested it, and I decided to try a variation on the rubbing style I had developed in my Montclair days. Back then it was all oil inks, but now what I have is water based inks. 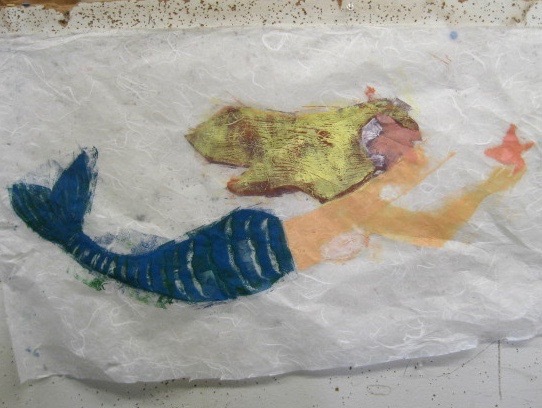 Both start the same, put the block face up on a table, place a piece of thin paper on top of the dry block, mix ink on the palette and get a brayer all full of ink, then roll it over the paper on top of the block. Where there is raised (uncut) wood underneath, ink is deposited, while where the wood is cut away the paper stays relatively clean. It can be done once, or in layers. Some interesting effects are possible, but consistency not so much, making true editions a major challenge. That's one reason I gave it up for a more traditional relief printing technique a year into my time in Carbondale. In this case, not wanting to have the block absolutely full of ink, I decided to experiment a bit with my old system. And it is a bit of an experiment, as I'm going from oil ink (where viscosity is used to create the layers) to water based inks. I prepared two pieces of Japanese paper, and mixed a few colors of ink. First a skin tone, then a dark color. The first was used to lay some color where face, arms and torso will be, while the dark color was used on the hair. On the first one I made an effort not to put the skin tone on her scallop shell top (above), but on the second try (below) I let the flesh color cover all her body areas. 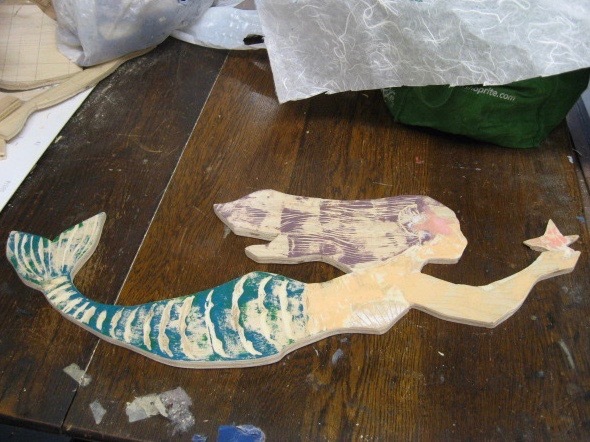 Then I mixed up a blue green and did the tail on the second piece, before repositioning the first sheet of paper so I could put the tail on the first one. Other colors will come, but I'll add the layers over time. Partly because I had a narrow window before my medical appointment, and partly because I think I want the first layers to dry before I add more on top. For example, the dark color on the hair will be mostly covered with lighter highlights, applied with a hard brayer that I hope will result in more of the carved hair texture being revealed. As I expected, some ink penetrated the paper and got onto the block, but not as much as would have if I did a tradition relief print from the block. What's there will easily be covered up by what I add later. As for the prints I started today, more work will be needed, then I'll decide what to do with them.